« Neutral, Native, Inter-operable CAD? Is it time to get down to business? Do you use 2D flat drawings to communicate your product designs? Does it make sense to hand over a 3D model to your manufacturer? Do you know how to take advantage of the SolidWorks software suite to enable your organization to leap into a model-centric product definition world? Do you need more educational support on MBD and MBE and how it might affect your design world? This is a great place to ruminate on the topic, and ask specific questions from someone who has used the tools in her own designs, and also has a big picture strategic view of MBE. On Wednesday February 11th, 2015 1:30-2:30 at the Phoenix Convention Center, Jennifer Herron will be sharing the vision on Model-Based Definition (MBD) and CAD Re-use within the SolidWorks and Enterprise PDM software suite. This is session is for beginner, intermediate and advanced users. What SolidWorks Plug-ins advance your skills even further? Presentation Title: If you could MBD in SolidWorks? Would you? Session Description: Do you use 2D flat drawings to communicate your product designs? Does it make sense to hand over a 3D model to your manufacturer? Do you know how to take advantage of the SolidWorks software suite to enable your organization to leap into a model-centric product communication world? Do you worry about what will happen to that model once it leaves your CAD expert’s hands? When using a 3D model for product definition, how do you ensure quality and inspection of the end item hardware? What if we showed you an end-to-end workflow using the SolidWorks suite and software partners? What if SolidWorks gave you new tools to jump-start your Model-Based Enterprise (MBE) adoption? 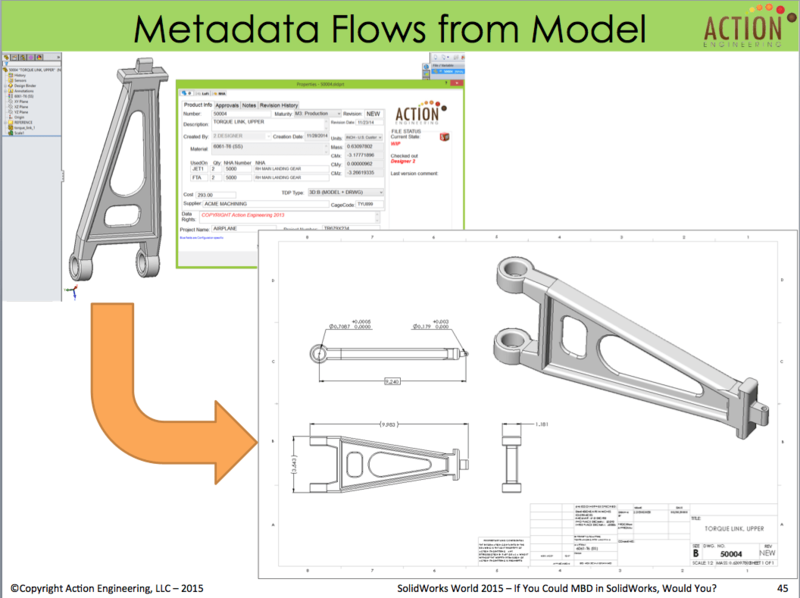 Check out Model-Based Definition (MBD) and MBE, from the user’s view. See SolidWorks and EPDM examples for CAD, PMI, data associativity, data validation, and 3D PDF creation. Learn what model-based processes should be the backbone of your organization’s product communication. This session will orient attendees to current business and modeling practice, AND military, commercial and international standards pertaining to Model-Based product definition (MBD). The examples shown include leveraging SolidWorks 2015 to create and deliver model-based data sets per MIL-STD-31000A and ASMEY14.41. Attendee Benefits: Attendees will see a CAD Model-Based workflow from conception to product delivery, receive an introduction to maximizing existing CAD and PDM tools to boost productivity, and be exposed to software tools that integrate with SolidWorks while enabling 3D model product definition. This entry was posted on Tuesday, January 27th, 2015 at 7:05 PM. You can follow any responses to this entry through the RSS 2.0 feed. You can leave a response, or trackback from your own site.